Konnichiwa, a Polish website that discusses all things Japanese, has posted an overview article about Japanese football. The article is available in Polish only; but I know some of you who visit this blog are from Poland. Writer Michał Wojtas and I exchanged some information about football in our countries, and it was great to learn a little bit more about football in Poland. Thanks for getting in touch, Michał, and good luck with the site! I thought I'd do a quick list of all the magazines about Japanese football that are available in bookstores and convenience stores across Japan. 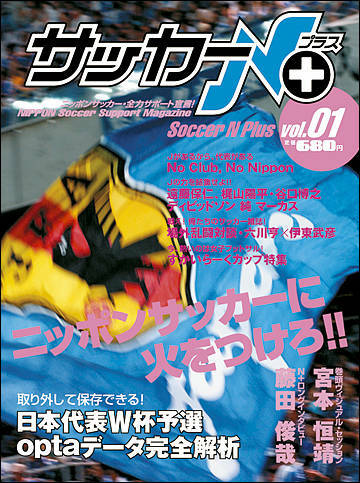 Soccer N+: National Team supporters' support magazine. 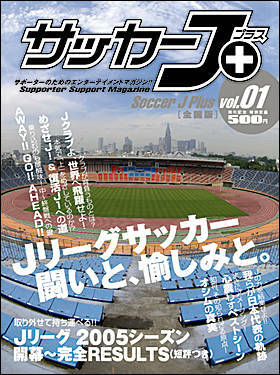 Soccer J+: J-league club supporters' support magazine. Weekly Soccer Magazine: Along with Weekly Soccer Digest, the staple of football fans (above photo). They have light interviews, and will at least do brief blurbs of all the games for that week. 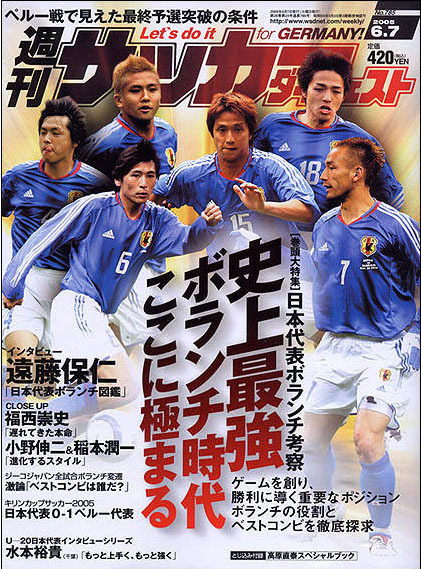 Football Nippon: Comes out a few times a year, heavier paper, bigger interviews. Footival: Comes out a few times a year, bigger interviews. Weekly Soccer Digest: Weekly fare, good for standing in convenience stores and doing a bit of skimming reading. Soccer ai: I'm not as familiar with this one; they don't have it at my nearby bookstore. Sports Yeah! : Have had some great interviews in the past year, but you have to keep an eye out. Sports Graphic Number: Also some great interviews, and they also have fantastic photos. There are more, but I can't think of them.... If you do, please add to the list by leaving a comment! Earlier in the year, I introduced a brand new magazine called Soccer J+ >>Click to see entry, which is basically a J-league supporter-oriented publication. The contents were more about how to increase the quality of life for club supporters, and the general tone of the first issue was enthusiastic, helpful, and fun. Now, the same company has come out with Soccer N+, which is the same kind of supporter magazine but this time for the National Team. I saw it on the bookshelves today, but I didn't have time to give it a good look. I think it would be on the same level as the J+, with information that is helpful to supporters of the national team, as well as a number of interviews, photos, and a look at what the supporters hope for the national team. One interesting thing was that their lead article was "No Club, No Nippon", discussing how without the J-league the national team won't get stronger. This is great news: A new football mag is coming out, called Soccer-J+. The main characteristic of the new publication is that this one will do what most/all other magazines don't -- they will focus on the J-league (not the national team). Their intended audience is of course the supporters of the J1 and J2 leagues. The aim will be to provide much more detailed and exciting information for J supporters, and also to develop better ties between the clubs and the supporters at the local level. Volume 1 (pic, click to enlarge) will hit the stores in a week. In addition to the nation-wide version, they are also making available different versions depending on where it is sold. So in, say Sapporo, you can buy the Consadole Sapporo version -- it is almost identical to the nation-wide version, but with extra pages that deal with the club. I think at least for the first volume, it will be definetely worth the \500 to take a look. Will report back with any meaty info and thoughts. Well, I thought I'd try and find another magazine to introduce this week, one that I hadn't touched on already, but this week the news is pretty much dominated by the National Team no matter where I look. There was an interesting interview of Zico in this season's issue of Football Japan ,(click here to see what FJ looks like) but it's on the expensive side and there was only two articles that interested me in it so I decided to buy the Weekly Soccer Digest (click photo to enlarge) again. I do promise that in the future I will try and introduce different periodicals so people who do not live in Japan get a taste for what's out there. 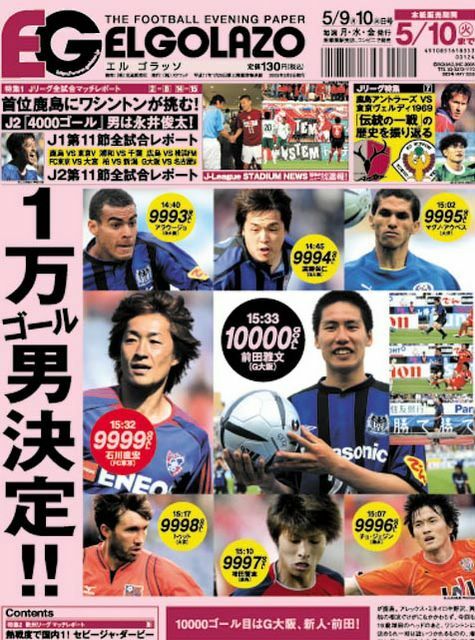 So, as you can see from the cover of this week's issue, the Japan NT is the focus of things. What caught my eye about the Digest was that they decided to focus on the fact that right now might be the Era of the Defensive Midfield in Japan. Of all the positions, this is the position with the largest number of players competing. If you have been following the NT in just the last year, you know that we have seen six very different types of players play here, in different combinations, during different games. Actually, if you count Yuki Abe, who was called to the NT at the beginning of the year NT camp, it is seven. First Article: "Late Arrival: Profile of Takashi Fukunishi"
Fukunishi had a difficult time getting a chance to start for the NT since the days of Troussier. He was called for three years since 1999, went to the World Cup in 2002, and then continued to be called by Zico, but it was only last year in June that he finally got his big break and held on. This was when rival Junichi Inamoto broke his leg during the England game. "I'm not particularly concerned by the Europe-based players, and I don't really think of myself as a substitute for one of them. But it is a fact that I get the chance to play when they are absent. I can't argue, this is a chance for me, and I want to put on a performance that first of all I am satisfied with. I want to get results," he said. Since the Asia Cup last year, Zico's trust in Fukunishi has noticeably grown. After that, even when Inamoto healed, Zico waited to call Inamoto until late December. Last year, the NT played 22 games total and Fukunishi has played in 18. This year he has started in ever single one so far. Even teammates acknowledge the growth and significance of his presence on the team. Teammate Endo said, "Fuku-san, maybe being originally a forward, has great strength in offense; however, he is dependable in defense and is probably the best all-rounder." Most people misunderstand his cool countenance as "not having ambition or hunger", but it is his strength that he retains a confidence and calmness that is not penetrated by surrounding distractions. There is a reason why he has evolved into an all-round type player. On top of any natural abilities, having the demanding presence of Dunga at Jubilo was a gift -- a great influence to improve and grow. As a high school student, Fukunishi was not part of any National Youth team. Even after he entered the pros, he only had his experience at Jubilo as reference. But even so, the various "educators" in his life have sniffed out his potential and kept demanding more from him. From the eras of Hans Ooft and Luiz Felipe, he was trained in the complete requirements of a "volante" (what Japanese usually call the dmf position, comes from Brazil's football vocab though argued it is not used correctly in Japan). And when Gjokica Hadzievski came and said "the presence of an offense-oriented libero is a must for the team", Fukunishi was given the task of filling that position. Then it was Takashi Kuwahara who came and focused on Fukunishi's offensive capabilities by not only having him play in dmf, but also as a game-maker and forward at times. So it was a big change from his high school days, when he only played as a forward. His encounters with different influencial people gave him the training and experience that has led him to be the all-rounder that he is now. Even Zico had been counting on Fukunishi's abilities from the beginning. However, various injuries kept Fukunishi from being able to consistently show his capabilities for a while. He has shown that his performance does not drop or rise according to who he partners up with in dmf, and has the flexibility to pair with different types. "As I've gotten more chances to start, I've begun to think more about the whole team. I think most about how best to move keeping in mind the team unit." Second Article: "How the DefMF Pairs Changed"
At the time of Zico took over the NT in 2002, the first choice for the dmf pairing had been Ono-Inamoto. Supporting their fellow "golden quartet" Nakamura and H.Nakata (omf), this was the shape of the JapanNT that brought the most excitement and hope among supporters. But in the two and half years since, a lot of changes have taken place. And the dmf players are currently in tough competition. It has been about a year since the Ono-Inamoto pairing has been seen. One or the other's injury has kept the two from meeting up in a long time. Even before that, it has been difficult to always have these two make it to all the NT games what with their club duties and negotiations not working out. This article is accompanied by a chart that breaks down the appearance of the dmf in all the Zico Japan matches, with all the pairing combinations, broken apart into those games that Zico was able to call everyone he wanted and those where he was unable to call up some of the players due to club issues. One thing becomes clear: if you look at the pairings that have the most amount of play time, the top three pairings all include either Ono or Inamoto: Ono-Inamoto, Endo-Inamoto, and Fukunishi-Ono. In other words, these two are up there at the top of Zico's list. In the Argentina game in Dec 2002, Ono-Inamoto was unavailable and Fukunishi-KNakata started. So we can read that these two were the top second-choices. In fact, until the Parguay game in June 2003, KNakata continued to get chances to play. What changed then? Well, the Argentina game that took place three days before the Paraguay game. Japan lost 4-1 to Argentina in this Kirin Cup, and this was when Zico made his shock move by overhauling the entire defense line. Along with the defense, he also decided to use that loss as a chance to fiddle with the dmfs. He gave Endo, who had just debuted with the NT the previous month, a chance. And that shape remained through the Confederations Cup which came right after. So until the October (Tunisia game) return of Ono from injury, Endo remained in the starting position. And so, from the East Asia Championships that year, the Endo-Fukunishi pairing continued when Ina-Ono were unavailable. During the 2004 Europe Tours Endo-Fukunishi continued to get chances to play. And then at Asia Cup 2004, they held fast through the tournament as Ina was still injured and Ono was off at the Olympics (though Endo was red-carded and could not play in the final of the Asia Cup; KNakata took over). And this year, the most surprising thing was that despite the return of full form Inamoto, Zico has kept Fukunishi starting. Also the pattern of pairings seems to indicate that Endo and Ono are competing for the same half of the two dmf positions, and Fukunishi and Inamoto are competing for the other. On the chart, we see that the Ono-Fukunishi pairing have a total of 351 minutes together, whereas Ono-Endo have 16 min. The Ina-Endo pairing have 390 min together, but Ina-Fukunishi have 45 min. We also mustn't forget that on top of these main five "true" dmfs, Ogasawara also sometimes slides down to play in dmf. But more interesting is the option of H.Nakata as dmf. He first played that position in this year's qualifier against Iran (HNakata started as omf in 4-4-2, but slid down when Ogasawara subbed in). In the next Bahrain game, Ono was out on ban, so HNakata started alongside Fukunishi with the team playing 3-5-2 and Nakamura as the single play-maker. The discussion in the above paragraphs showed the changes to the pairings over time as a pretty logical progression. However, add HNakata to the pot and lots of things are no longer clear cut. First of all, Zico has not been using Inamoto since the friendly against Germany last December -- though Ina is pretty much to full form now. That priority ranking of having Ono-Inamoto as top choice is no longer the rule. And now the question of how to use H.Nakata if the team keeps playing with a 3-5-2 system. This Bahrain game was the first time HNakata was playing in the 3-5-2 formation. (Until Nakata's injury last year, Zico Japan played in the 4-4-2 formation.) With the introduction of this option as a workable one, Zico now has one more alternative. And on top of that, HNakata is a different type of dmf player than those that already exist in the NT. Now that Ono is back from his ban, and Inamoto is getting stronger, it is difficult to predict exactly what pairing will make it onto the pitch at the next Bahrain qualifier. And what system will be used. Article 3: "Yasuhito Endo & his DMF Teammates"
Zico's requirements: The thing Zico tells us the most is that first, do not lose/give up the ball. Of course, first your duties are to defend and then pass the ball. But the job of dmfs today also requires us to be able to see ahead -- to the offense. And I don't really think that Zico is as concerned with the pairings he starts in a game. He's pretty egalitarian/impartial about it. The basic outline is to have two dmfs; but depending on who those two are, the job for each is a little different according to the pairing. At the end of the day, the two have to talk to each other, confirm who does what and how and when, how they will maintain balance in midfield, etc. I personally have fun no matter who I'm paired with. Each has their idiosyncrasies and strengths, and that may lead to slight changs in the way I play. With Shinji (Ono), we like to take advantage of his long passes. With Hide-san (HNakata), it's that directed pass with a plan. With Fuku-san (Fukunishi), it's to make proper passing sequences. With Ina (Inamoto) it's to get him in front as much as possible. With Koji (KNakata), we like to focus on our balance. At Gamba Osaka (Endo's J-league club), I play much more offensively, up front. But at the NT, it's quite different. The speed with which we put pressure on the opponent is probably the biggest difference. At the NT, it's much more about "safety-first". Usually I'd want to put pressure at the point 10 meters in front; but depending on the opponent, or what our plan is, it affects that decision of where and when to got for the press. First our job is to create a good rhythm in the passing. Without that, the team just goes out of sync. So the dmf's job is very important to the overall health of the team's tempo. Zico's ideal is 'fast and quality passing'. That is the base on which we build. And we are told not to go forward if there is a certain amount of risk involved. Well, that is one of the first differences compared to Gamba. And so there is a need to change my style a little at the NT. But it's the NT, so that's a given. And we dmfs all understand this and play with this first in mind. About H.Nakata: I haven't had the chance to see him as a dmf much. But he maintains his style no matter where he plays. First and foremost, Hide never passes the ball backwards. And when he is able to get the ball relatively unobstructed, he can take advantage of that incredible long-range shot. And I think that he has certain abilities that shine more when he plays as a dmf. He can hold onto the ball despite pressure, and depending on the play he can move the whole team forward offensively. Especially if he plays in that area just behind the omf. About Fukunishi: I've said this before, but among the current group, Fuku-san is most able to "do anything". He's strong heading, has a strong body, is a great passer. He doesn't kick long-range shots or long passes, but I think if he thought to do them he'd probably be good. In the J.League I think he has the greatest presence of the dmfs, though I never thought it particularly difficult/taxing to play against him. He's very cool and collected, and he sort of hunkers down in the middle without being pulled to the sides. That's great. When he plays with me or Shinji, he plays like this. But I think at Jubilo he goes up more -- he's a very clever guy. He doesn't force himself to go forward if it's not optimal. And the other thing is that he doesn't dribble -- I say this as a good thing. When he gets the ball, he gets it out again without playing around with it much. I think his stability allows the offensive players to go forward without worrying about what's going on behind them. And I hear he may seem a little scary at first, but he's actually really sociable and good humoured! About Inamoto: I think after going to the Premiership, he's gotten much more offense-oriented. When you look at the 4-4-2 system they use in the Premier, the center is flat, so you'd have to really be attacking continuously. In that formation, if you go for the ball and the opponent can fake you out and get past, you're in trouble. So Ina's time there has probably made him increase in toughness and accuracy. When Ina decides "now" and goes forward, that's his best move. I've played with him a lot, so I'm most comfortable with him. I can play very evenly with him. We keep an eye on our distance from each other, balance, and understand each other. Though it has been a while since we played together... Before, I think I'd play a more offense-oriented role between the two of us, but now I know he'd be the one to go up more. About Ono: Genius. I'm hard put to think of anything else to say about him. I mean, I don't really like to use that word, but I have to here. He wasn't a dmf to begin with (Ono originated as omf). But even if I were coach, I'd put him in dmf, in the center of the machine. In current football, if you play in omf the pressure you get from the opponent is extreme. And for Shinji, I'd want to give him as much space and freedom as possible. His passes are so accurate, and he can also send out long kicks, and though he is not a defensive specialist he does the job at a high enough level. He's good at getting rid of the guy marking him, and he has the ability to see what's going on around him. He also doesn't dribble much but aims great through-passes, which is one of my favorite things about him. lol. The game is affected by how much you can get the ball to him. Everyone puts great trust in him, so we all look to get the ball to him. Personally, I would love to see the Ono-Takahara (who is a forward) connection fired up again. And along with Ina and Hide-san, Shinji is another who should go forward as much as permittable. About Koji Nakata: I think going to Olympique Marseille is going to be a huge experience for him, a catalyst. Koji is...his head. Yup. The height and the brains, both meanings. He is able to play with the interests of his teammates in mind. And because he's played in a number of other positions, that experience has been a plus for him. And when it comes to effort (gambaru), he probably has the best attitude about putting in the most effort possible. Taking on whatever tasks required. Like Fuku-san he hunkers down; but these two are very different. If Fuku-san assesses the situation and thinks he isn't going to do much good in a certain place or against a certain individual, he will cut away and find another position to follow-up on the defense. But Koji, he stubbornly persists against the opponent. With regard to delaying the opponent, he is number one. If he is marking you, it's hell. lol. And finally, his left foot -- Koji has speedy and accurate middle-distance passes. About Me, Endo: I guess I don't lean too much either offensively or defensively. Not sure what this means, but... But if I'm told do the defense only, I could do it. Anyway, I have so much respect for my NT teammates. I think it all grows out of our trust in each other. And even if I don't have a starting position, though of course I hate to lose out on that, I don't feel frustration or dissatisfaction about the team over that. I just have to keep working harder to be worthy of getting that position back. P.S. Well, it's almost the last two qualifiers. This is where we want to put all our energy and focus. To be honest, I was a little curious to go to Pyongyang (North Korea). But I was also pretty worried about playing on the artificial turf there, so I guess this worked out okay. I'm used to playing in Thailand, and I have a good image of the place. As for the no-spectators; Not sure. Maybe it will work for Japan, who knows? Heh heh, just got home with a copy of this (←pic of mag, click on pic to enlarge). This is the Shukan Sakka- Magajin (or Weekly Soccer Magazine) one of the staples of any football fan looking for a weekly fix of football news in Japan. Most people swing back and forth between the Magazine and the Weekly Soccer Digest, depending on what articles are inside that week. Since I already introduced the Digest, I thought this time I'd take a look at the Magazine. No, I did not choose it because there happened to be a profile pic of GK Kawaguchi, or because it included posters of FW Suzuki and DF Miyamoto (all in NT uniform). Seriously, I'm not that big of a ditz, and not 16 anymore! (the lady doth protest too much..!) And the posters were a joke anyway -- really horrid shots. But if anyone wants it email me and I'll snailmail it to ya. Just to warn you though, there are several stapler holes in the poster.) A-hem. 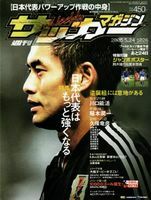 Anyway, this issue started off with a couple "eh" interviews with Kawaguchi and Junichi Inamoto (West Bromwich, dmf). Nothing particularly juicy, but the interview with Inamoto was a little interesting. He discussed his situation/position at his club, and at the NT level. At the NT, he admits that this may be a time to be a little patient. While he was recovering from injury, he missed out on a lot of the big battles last year and he can understand why he did not start in the last two NT qualifier games. However, he also added that he hoped that Zico would give him a chance to start in the upcoming friendlies against Peru and/or UAE -- that if he was benched again, he said jokingly, he may have to have a word with the coach. The magazine has been selling this "have to have a word with Zico" comment as some big throw-down by Ina, but I didn't read the interview that way. Of course the mag had that quote chopped up and enlarged on the cover -- giving a lot of people the inaccurate impression about Ina's attitude when he spoke the words. I've seen a number of people on the net commenting about it... whether Ina has the right to say something like that when he barely makes it to the bench in his own club and has not really contributed to the team for a year (not his fault, but other's performed while he was away, and them's the breaks). I don't think we should read too much into it, knowing Ina's personality. Ina also said that he's been working on getting stronger in 1-on-1 matchups and improving the quality of his dribbling. 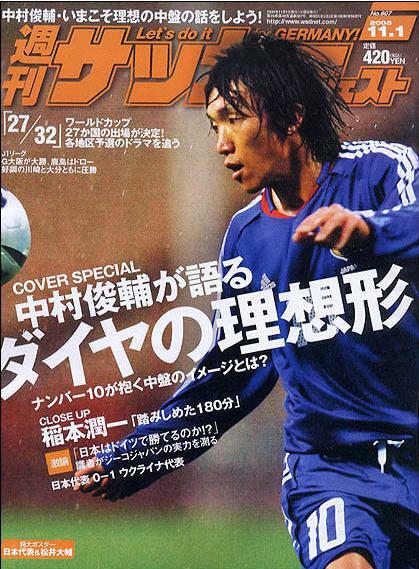 There's also a "Why Tatsuhiko Kubo is so good" analysis article written by former forward for Nissan and Marinos as well as ex-international Takashi Mizunuma. (He now works in the media, as writer, football news show co-host, and game commentator.) The article about Tatsuhiko Kubo discussed his strengths. 1) His ability to be "play dead", make the defender relax, and then suddenly turn "on". 2) Balance. He doesn't use textbook methods, but is able to change gears to attack very quickly. He also has a natural sense of balance allowing him to take volley shots in the air and on the ground with a unique sense of timing. 3) He doesn't fear taking a nice big healthy kick when he shoots. Most players when they find themselves in a shooting situation shy away from taking a big ole swing for fear that it will screw up the timing of their shot and go wide. It is valuable for forwards to throw in a few big kicks like these, as it gives the opponent the impression of power. 4) His comprehensive style allows for many offensive options for the team. Kubo kind of floats around in the middle lazily, but can change gear and suddenly play post, or can slide to the side and get the ball there, or can invite a vertical pass through the defenders. His ability to not give the defenders any clue as to what he's going to do next is a big part of why he is considered so effective. For those who are have forgotten how Kubo plays after all this time, here's a video of the two goals he scored against Iceland last year. Weekly Soccer Magazine has a section called the Humane Footballer, an interview with a player in the J. The website posts portions of these interviews after the magazine comes out, so you can check there to see if any of your favorite players are featured. This issue's Humane Footballer was Omiya Ardija's Jun Marques Davidson (I hear he's called Marques on his team, so I'll refer to him this way from now on). And... sorry! I'll get to it in my next entry. This is Japan's first football newspaper, El Golazo (click on pic to enlarge). Though many J-league fans grumble that it tends to be biased towards certain favorite teams (particularly in the beginning of this season), it's still very cool to finally have a paper like this here. This little pink publication comes out Mon/Wed/Fri -- though it isn't as meaty in content as the wealthier sports mags, it's still a good place to go for a "fix" during the week between rounds. Today's EG featured the 10,000th goal on its front page, with a countdown of the eight goals that led to the historic one. This was the first ever goal in the J-league for rookie Maeda. He was a college student before he signed with Gamba this year. For his first ever goal to also be the coveted 10,000th... pretty heady stuff. In an interview after the game, Maeda said that he was happy, but the reality of it had not set in yet. All in all, a very good day for Gamba Osaka -- three goals, their rookie gets the historic goal, and they win the game. This season, the J-league returned to a One Stage format. Previously, the entire season was split into two stages: at the end of the season, the winner of the two stages would fight it out in home/away games and decide the "true" champion of the year. In the 2003 season, Yokohama Marinos won both stages and asserted their quality. In 2004, Marinos won the first stage, Reds won the second stage, and the two teams battled in two stress-filled games that ended in a penalty shoot-out for a Marinos win. With the One Stage format, the now-18 teams in J1 have a long road to travel to arrive at the true "true" champion of the year. Continuing in my log of interesting articles found in this past week's Weekly Soccer Digest No.780 (next week I will find a different magazine to read from), I found an article written by FC Tokyo coach Hiromi Hara (he wrote it prior to the start of the season) discussing the concerns surrounding the One Stage format. The season has already started, but with all the notable surprises in the rankings so far I thought it would be a good time to review this issue and see if we may be facing these concerns.. The move to a One Stage format was a natural one, and I was in agreement with the decision. Who is truly the strongest team? There would be little doubt as to who the true champion is. This is a good thing. But is this system really good for all of us? It is important to view the One Stage format with some caution. Will this format cement itself in Japan? This is probably the question that will be asked of the Japanese football culture. On the whole, Japanese are characterized by a short attention span, a tendecy to give up easily. This year, with the number of teams increased to 18, I wonder if the supporters of all 18 teams will stick it out to the end. I wonder if the total spectator numbers will decrease for each team. From the position of coach, there are many surrounding aspects that I honestly cannot calculate. For instance, if the team loses three games in a row at Home, if the team gets off to a bad start to the season, I don't know how that would affect things. If this was the Two Stage format, the supporters and the players are given a mental "reset" button at the end of the first stage (halfway through). They could say to themselves, "Well, there's nothing we can do about the first stage, but we still have the second stage. There's still a good chance for us." The two stages, the championship-deciding game -- these are a couple of extra things that help support the energy of everyone involved in the J-league. The Two Stage format had its advantages. The 34 games that stand before us until December. It will be a long season, and if a team starts slipping in the rankings partway through it will become very difficult to maintain motivation within the team. And with that, my biggest worry is that the supporters may start losing interest. My point is that basically the only aim will be to rank #1. In the European leagues, the top 4 have the Champions League, the top 6 have the UEFA Cup to look forward to. On top of that there is the excitement from the League champions-deciding games and the relegation-avoiding games. I think that it provides the teams and supporters with various things to get excited about. But in the J-League now there is only the latter two -- league champions and relegations. Once we get mid-way into the season, there will be little for "middle-ranking" teams to focus on or fight for. There is a danger that these teams in the middle will be left in a sort of vacuum. So for example, from a personal point of view, it may be exciting to give the top 2 teams a ticket to the Asian Champions League. Or, have the league #2 team play the Nabisco Cup winner or the Emperor's Cup winner for the second ticket to the ACL. Or to also incorporate the A3 into things somehow. These things may spread the excitement out at bit more in the J-league. In the J2, the top 2 teams make it to J1; and the #3 team fights it out with the J1 bottom team. The number of teams is much less than the J1, so the target of making it to the top 3 is a good possibility for all teams and it keeps motivation up for the majority of teams. The excitement lasts from start to finish. I believe that this season's J1 will see many like-strength teams and we will see lots of bunching up in the rankings. This will help keep hope up for many teams and supporters. Of course, FC Tokyo will participate full throttle in that race to the finish line. So it would be a shame if we lost some of the excitement and energy that was there until last season. It will become important to have foresight and figure out new ways to maintain the energy and interest levels within the J league. There should be a way to tie some of these things together. I especially like the concept of involving the A3 because J league teams are woefully unprepared for the ACL group stage games as it is. Very few teams have players experienced in non-J-League refereeing, playing in different countries, playing against K- and C- league teams (who play with emphasis on physical and have a different style), and so on. Not only that, most Japanese football fans have absolutely no clue or interest in other Asian leagues, teams, and players (aside from those with top NTs)... there is little understanding, appreciation, or respect, really. On the other hand, there are issues of finances and scheduling that I can't debate because I have very little info on how these things get decided. Anyway, it will be something to watch for -- how will the supporter numbers pan out? how will the J league respond if the numbers start to dwindle? will they take preventative action or only act after the fact? I did promise in this entry (at the end) that if I learned anything more/new about that Round 5 game between Verdy 1 - 4 Sanfrecce I would follow up. Well, I had totally forgotten that I slurred my way through that game -- and didn't even finish the commentary. Oops. Sorry! It was a chilly night with a harsh northern wind. April 13, Ajinomoto Stadium. We were facing Sanfecce at home. Verdy returned to the lockerrooms after a first half devoid of any commendable play 0-1. When we got to the lockerroom, we were greeted by our coach "Ossie", fuming with anger. "The content was tragic. If you're going to lose with content like that anyway, you may as well take the risk of giving up 5, 10 goals and at least show some ambition for the goal. I am feeling absolutely no passion from you guys," he said. The tone of his voice was no different than usual, but his bright red ears gave away his inner emotions. We had been on a non-losing streak for 11 games counting back to last year, but the Frontale game (Round 4, 0-1) gave us a taste of defeat we hadn't had in a while. So before this Sanfrecce game, Ossie said to us, "The key to today's game will be to think of it as a new beginning, a fresh start. This is an important theme for us to digest emotionally." He had stressed the importance of the spirit in times like these. Going into the second half with renewed energy, my position changed from the back line to midfield; but we ended up allowing an early goal again. A wet blanket was thrown over us mood-wise, and we couldn't quite grasp our tempo. We tried to "show ambition for the goal" but I ended up getting my second yellow card and had to leave the game. It was truly like having the rockets die out before we even had liftoff. I wonder how long it's been since I've experienced such humiliation. It was completely understandable for Ossie to get angry. At the meeting the next day, Ossie dealt with our psychological damage. "Yesterday's game was the worst game I've seen since coming to Japan. It's one thing if we play our very best, and it just turns out that the other team was just a little better than us and we lose. But we basically gift-wrapped the win for them. Luckily for us, we have another game soon (3 days later, game against Omiya) that will give us a chance to leave that humiliation behind. So let's get properly prepared and work. We won the Emperor's Cup, we won the Xerox Super Cup, and then things got weird for us. Until then we were making a really good effort to play well. But the moment we got to that level, we stopped making that effort." Always rise to the challenge. We have to express this feeling on the pitch. That night...with the cold northern winds scattering the sakura blossoms, the sign of Japan's spring... that night is over. And the warmth is returning. Now that our bodies and hearts have reclaimed the heat, we have to recall the forgotten spirit of rising to the challenges. We will be aiming for the crucial four wins during the game-packed Golden Week period.